The Rogar Double Bookshelf Wall Mount Pot Racks features twice the space as the bookshelf. Rogar pot racks show off a great set of cookware as well as free up precious storage space. Choose from 13 different finish and accessory color options to find the perfect match for your kitchen. The double bookshelf pot rack makes it easy to reach for the perfect pan or utensil fast, while adding warmth and style to the most used room in the house. 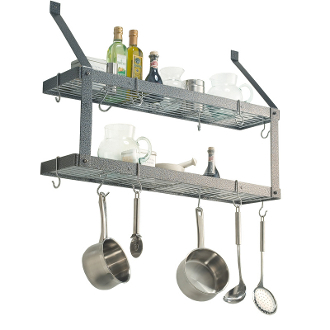 A wall mount pot rack is ideal for kitchens with limited space or low hanging ceilings. Mount this Rogar pot rack in any room of the house as the multipurpose shelf will hold tools and equipment out in the garage, tidy up the kid’s room, and provide a nice display for all your cookbooks in the kitchen. Like all Rogar pot racks, these wall mounted pot racks are 100 percent grade powder coated steel made in the U.S.A. Chrome Bookshelf is made from a polished chrome plated steel. Powder Coat Finishes include: Hammered Steel, Black, White, Hammered Bronze, Hammered Copper, Rust and Red. Accessory options include Chrome, Black, Brass or Copper to accentuate your pot rack. Pot rack includes mounting hardware, six Eye Hooks and two 2 ½ inch “S” hooks.